This walk: 2011-6-8. Stone row, cow, cairn and cist, sunken lane, Black Tor, Devonport Leat, clapper bridge, Red Indian or Turk's doll's head, aqueduct, River Meavy, logan stone, round house, gate hanger, stile, dung bonnets, Stenlake Farm. Two double stones at the end of a stone row, these are at approx. SX 56210 70803, from where the row runs westward from here. Sharpitor, SX 7722 8142, elevation 410 metres (1345 feet), owned by the Dartmoor Preservation Association. Guess what - its a cow, just moo-ching around! Another view ..... mentioned by Jeremy Butler, 1994, Dartmoor Atlas of Antiquities, Vol. 4, pages 46-47 (13: Sharpitor North-east double stone row and nearby cairns). Ditto - with Moor Strollers in the background. A sunken lane that led down to Stenlake Farm (see more below). Stenlake Road - in 1823 William Bickle was paid 1d per yard for repairing ditches along the “road” which would have linked the Meavy Valley farms with the Walkham Valley farms. It must have been built long before wheeled conveyances were ever seen on the moor, being wide enough for packhorses..
View to Black Tor, SX 573 717, elevation 360 metres (1181 feet). Having gone down the slope we reached Devonport Leat. The leat was started by Plymouth Dock Waterworks (Dock Water Company) – a private concern formed to survey the leat and provide water to Devonport and the dock yard, it was built between 1793 – 1802. Contract awarded to Thomas Gray in 1793, final total cost £23,400. The leat yields up to 3 million gallons a day from a watershed of 4716 acres. Gathered at SX 5705 7106 to hear about the now-overgrown Bronze Age settlement in the background. A closer view of what was once a large village. Nearby, the leat bottom is "stepped". The Red Indian or Turk's doll's head set in the wall of the leat:' set into the southern side of the leat, at SX 57233 71306. More details can be seen here from another walk along this way - the head is seen in greater close-up (the photos following here give visual clues as to the location, including the tree behind you as you look at the head). There is more information on the Legendary Dartmoor web site, here. The head was probably inserted during repairs in the 1930’s. It was vandalised in 1984, guide Tom Gant had taken an impression of the original and a resin replacement was made. Closer view - there seems to be no definitive image of this feature to refer the reader to. This is a replacement made from a cast of the original that became damaged and now this replacement is damaged. I remember in the 1970's that it was a very clear doll's face. The steel pipe bringing water from the River Meavy (into which Hart Tor Brook has already flowed) and Devonport Leat (coming from Raddick Hill on the right). 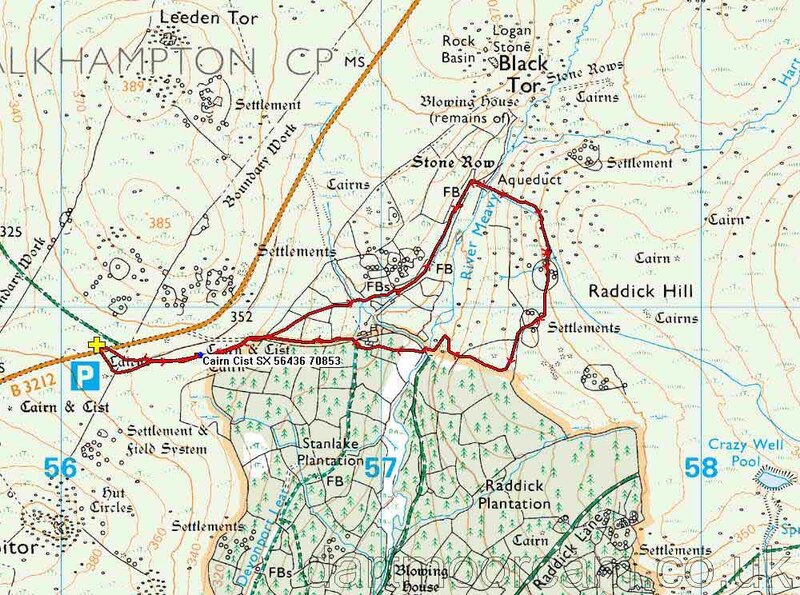 Looking up Raddick Hill, with Devonport Leat running with very little water. The pipe with water from the River Meavy (and Hart Tor Brook). Looking along the aqueduct: there is a sluice at the far end but it is not diverting water from the leat. Standing on the aqueduct, looking eastwards, down on the River Meavy. Climbing Raddick Hill, beside the normally-cascading leat. There are two short 'movies' at the bottom this page. View down the Meavy valley - it was well-worked over by the old tinners. Black Tor, showing the logan stone on the left. Sitting in a round house just outside one of three enclosures on Raddick Hill. This area is described by: Jeremy Butler, 1994, Dartmoor Atlas of Antiquities Vol. 3 - The South West, pages 55-56, 3 - Raddick Hill West enclosures and cairns (fig. 46.3). Bronze Age or Iron Age gate hanger in a granite post?! Part of an enclosure (presumed newtake) wall at SX 5743 7092. "Keith" ..... "I know my place" - Coprophilous fungi: known as Dung bonnets, Bolbitius vitellinus. This structure is probably just a fence across the river rather than a primitive filter to stop anything floating down to the reservoir. The ruins of Stenlake ("Stean Lake") Farm, where the leat enters the wood. The farmhouse still had a roof up to 1960 when after a dry summer, it fell in. Where the leat runs into Stanlake Plantation. Caught in the rain - as a heavy shower came in just before the end of the walk. This walk was reached very easily, by driving out of Daousland towards Princetown, going over the cattle grid at Peek's Hill, over the crest of the hill and parking down on the left side of the road where there are two car parks: see the yellow cross by the P symbol on the map.